This is a spectacular map of the Pacific and its islands from the early part of the 19th century. 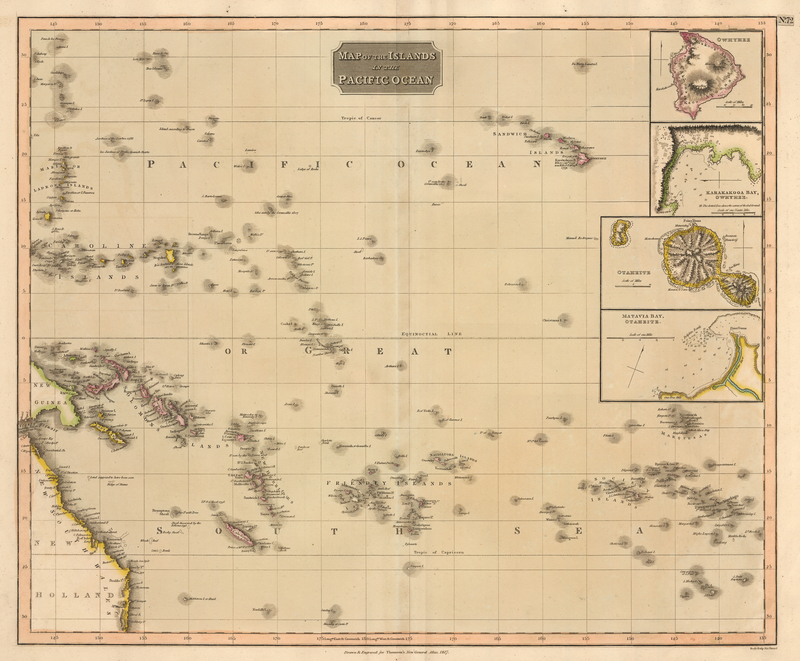 Centered on the Equator, the map expands from east New Hollands (Australia) to the Sandwich (Hawaiian) Islands, including the Marianas, Friendly Islands (Tonga), Caroline, Solomon, and Society Islands within. Four insets show Owhynee (the Big Island of Hawaii), Karakakooa Bay, Otaheite (Tahiti), and Matavia Bay. All insets include a compass rose for orientation and they two insets of bays are detailed with depth soundings. John Thomson (1777-1840) was a Scottish cartographer based out of Edinburgh who is most well-known for his 1817 New General Atlas. This monumental work provided maps of great detail for nearly every country and island across the world. While other map makers would fill empty and unknown spaces with vignettes and geographical assumptions, Thompson elected to leave such spaces void of any uncertain cartography. Condition: This map is in A condition with original color on heavy paper and full margins. 1693 ﻿Mer De Sud ou Pacifique. Contenant L'Isle de Californe, les Costes de Mexique, du Perou, Chili, et le Detroit de Magellanique , & c.